Ponytail, meet party. "This version comes across as sophisticated yet doesn't seem like you're trying too hard," says Redken Global Creative Director Guido Palau, who did this look. If your updos often come undone, try criscrossing two bobby pins over each other to keep it in its place. For good grip, be sure the ridged side--not the smooth one--is against your scalp. How to get the look: Apply smoothing lotion from midshaft to ends, then blow-dry with a round brush. "AÂ sleek finish transforms the style from everyday to special occasion," says Palau. Mist hairspray onto fingertips and draw hair back. As you secure the pony with an elastic, pull strands only halfway through so you make a loop with the ends sticking out. Spritz with hairspray. 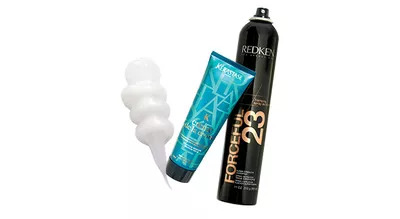 Pro picks: KÃ©rastase Couture Styling CrÃ¨me de la CrÃ¨me ($33, amazon.com) and Redken Forceful 23 ($18, ulta.com).